BeeRaider is a computer keyboard company supplying patented physical and virtual 21st century designed ergonomic keyboards for improving user work productivity. Our Optimized Radial keyboard has been designed to address the shortcomings of the existing standard QWERTY design. It facilitates those users looking to improve their productivity and keyboarding skills by offering them the means by which they can increase their data-entry speed and efficiency. BeeRaider also offers our QWERTY Radial keyboard for those who prefer to stick with a QWERTY style layout. 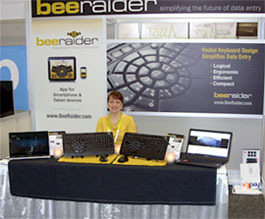 Learn more about BeeRaider and its wireless keyboard products by visiting our Products page here! We chose to develop a radical new ergonomic keyboard design with our Optimized Radial keyboard because we felt that the time was right to challenge the dominance of the QWERTY keyboard standard, which previously originated as a late 19th century design for mechanical typewriters. The ergonomic design of our keyboards reduces operator fatigue and discomfort because they allow the user to more naturally position their hands over our unique Radial Keyboard design. The radial design of the main-key-cluster seen on our current desktop keyboards is also approximately 1/3 smaller than the standard QWERTY keyboard area, leaving it more ergonomically compact. This all helps to reduce finger-travel-time thereby facilitating an increase in data-entry typing speed. The larger keys available for the weaker fingers of the hand encourage the user to use their less agile fingers, allowing them to move away from the considerably slower ‘Hunt and Peck’ approach that is used by the majority of today’s keyboard operators. Our Optimized Radial Keyboard includes all the advantages already mentioned and which apply to both our QWERTY and Optimized keyboards but it has also been designed to be more logical and efficient to use. The location of the alphabet keys can be memorized in about 10-20 minutes. The most frequently occurring alphabet character keys are deliberately arranged in such a way as to be within easy reach of the user’s two index fingers. This approach ensures that a user’s finger-travel-time is kept to a minimum. Learn more about BeeRaider product design by visiting our Design page at: here! The advent of a new era in portable computing devices has further exposed the inherent weaknesses of the QWERTY design and we believe that the time is now right for an alternative solution in the form of our new logical, ergonomic and compact Radial keyboard design. BeeRaider’s product philosophy reflects its founding principles of creativity, innovation and quality. BeeRaider – simplifying the future of data-entry!